An initial circular cylinder collapses and creates shock and rarefaction waves. The initial condition are radially-symmetric and should remain so. The problem is discretised using longitude-latitude spherical coordinates. Deviations from radial symmetry are a measure of the accuracy of treatment of geometric source terms. This test case was proposed by Rossmanith et al, 2004, Figures 5 and 6. The domain is 150 degrees squared, centered on the origin. To initialise an accurate, sharp initial dam, we use a volume fraction computation. The acos(…) formula is that for the great-circle distance from the origin. Mass must be preserved to within machine precision. This is a check of the consistency of the (adaptive) spherical metric. We store the average solution in bins of one degree. 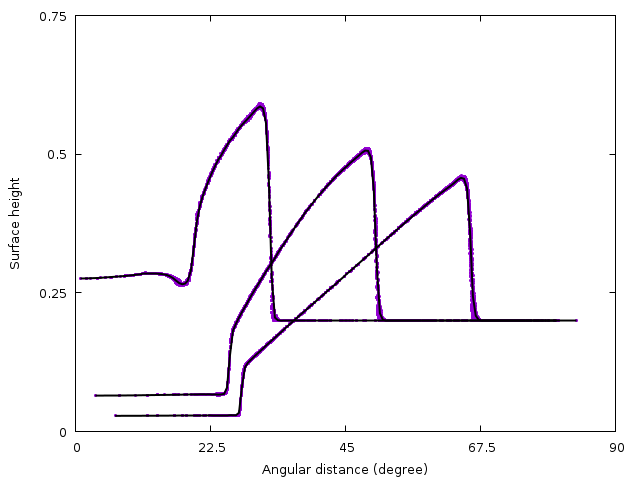 We compute the RMS error between the grid points and the average profile. Scatter plot of the (radial) solution. The black lines are the average solutions. The solution is shown at times t=0.3, t=0.6, and t=0.9.